Second Ave Subway (T) (Q) -- an update - When pigs fly. The Second Avenue Subway (T) is New York City's first major expansion of the subway system in over 50 years. When fully completed, the line will stretch 8.5 miles along the length of Manhattan's East Side, from 125th Street in Harlem to Hanover Square in Lower Manhattan. In addition, a track connection to the existing 63rd Street and Broadway Line (Q), will allow a second subway line to provide direct service from East Harlem and the Upper East Side to West Midtown via the Broadway express tracks. I blogged about the 'SAS' on December '08, but have been somewhat quiet for the past 15 months. Despite the poor economy, the MTA running into even more debt and some pessimists who wrote me comments like "don't hold your breath", the Second Ave Subway construction is still going strong! Another fellow blogger has been documenting the entire project at The Launchbox, which as a lot of photos, commentary and information about the SAS project, including older photos of development, such as "Second Avenue Subway Construction in the 1970s!" The MTA's official SAS page has been updated to include more detail -- a revised timeline for Phase 1 (which began in April 2007) is now scheduled to be completed in 2016. When complete, the (Q) subway service will extend north to the new 96 St & 2nd Ave station. 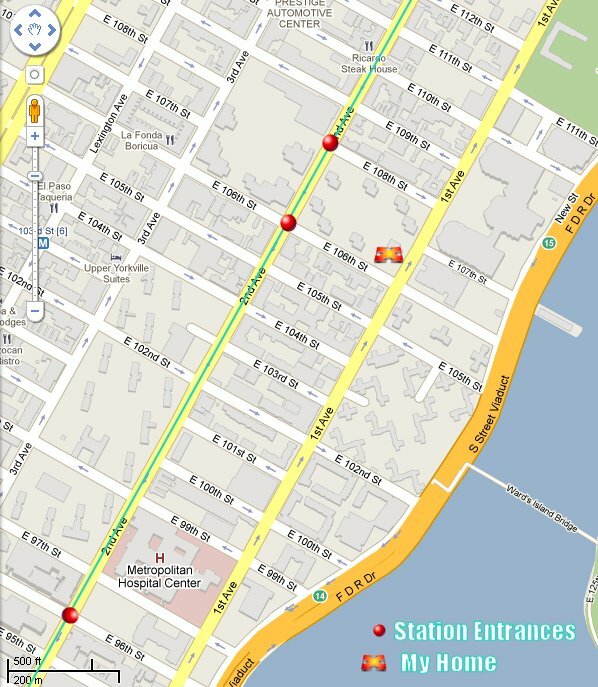 Other new (Q) line stops along 2nd Ave include: Lexington Ave/63rd St, 72nd St and 86th St! Phase 2 construction will occur from 125th St to 105th St (utilizing an existing subway tunnel section from 110th–120th Sts) -- that's when the Subway stations at 106th and 108th (on my block) will be opening! The subway service provided will be from 125th St to West Midtown Manhattan and Brooklyn via a further extension of the (Q) train train (the Broadway Line). Phase 3 will include the development of the new (T) subway which will traverse 2nd Ave from 125th St all the way to to Houston St! When this is completed, you'll be able to go door to door from my home to the East Village (stops on both 14th St & Houston! Yeah, it's still taking longer than expected -- but it's happening! Yes this project is "damn the torpedos full steam ahead" because of its employment and the subway serving the East side are dangerously over crowded (an accident waiting to happen in the words of the MTA). Due to the nature of how subays are built in NY, expect timelines to slip. They really do not know what is in the ground untill they start digging. Also they have to be cautous as to not damage the buildings, and that can be an unknown. They've been talking about and tentatively digging this one since I was at Columbia in the 1970's. While I live in hope that I'll be able to ride it before I die, things are looking more and more ominous. The differing construction practices these days mean that construction is slower than it was when the IND was built in the first half of the 20th century. Then they just damned the torpedoes and cut and covered, making speedy progress. Today they tunnel underneath, very carefully, and this takes time. One other reason for the tardiness is that the state had a habit of selling bonds for the Second Ave. Subway and then using the proceeds to plug deficits rather than dig. It's interesting that here the extension of the DLR from King George V station to Woolwich Arsenal was completed in a couple of years, despite having to tunnel under the Thames. Granted, there isn't much under the Thames to displace the tunnelling.